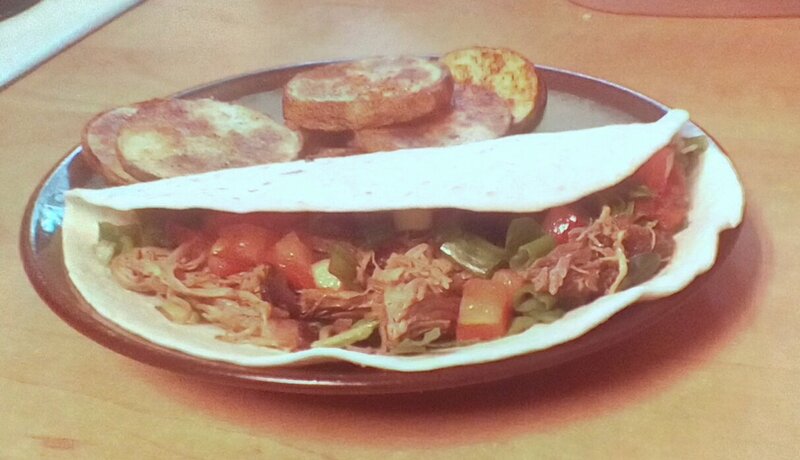 It was a stormy night and dinner was pork carnitas and roasted potato slices. I got this recipe from http://therecipecritic.com/2015/04/slow-cooker-pork-carnitas/ and the only change I made was to increase the salt to 2 tsp and bake my pork at the end instead of broiling. You can skip that step but your meat will be drippier and messier to eat if you do. I love using my slow cooker and this is a great recipe for it! It was especially great tonight as our power was flickering on and off just before dinner. I was really glad the pork was already cooked and the potatoes did not take long. Everyone in my house really likes this pork. It makes quite a bit and you can use the meat in other dishes like sandwiches, empanadas, taquitos or whatever you like. Hagbard is already looking forward to bbq pork sandwiches made from the leftovers. I’m putting a bunch of the meat in the freezer for other meals. Combine chili powder, cumin, oregano, salt, and pepper. Rub spices on the outside of the pork shoulder. Combine orange juice, lime juice, garlic and onion in slow cooker. Place pork on top. Cook on low for 8 hours or high 4-5 hours. Shred cooked pork. Heat for 30 more minutes. Remove the pork from the slow cooker and place on a baking sheet. Cooked in a 400°F oven for about 10 minutes. Serve with your favorite toppings in a tortilla. Roasted potato slices are very easy to make and are one of Amethesto’s favorite side dishes. I sprinkled some taco seasoning, salt and pepper on my potatoes this time but you can use other seasonings. Heat oven to 400 °F. Cut potato into 1/4″ slices. Spray baking sheet with cooking spray. Arrange slices so they do not overlap. Spray tops lightly and sprinkle with seasonings. Bake 25-30 minutes, turning over and seasoning the other side at the halfway point. You can also cook sweet potato slices this way.